Do you feel like refurbishing your home? Then you are probably going to need building services. 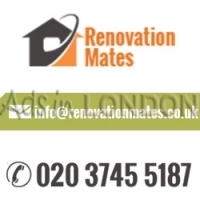 In London one of the best providers is Renovation Mates Ltd.. Our building services are one of a kind. Our builders are competent and trained. They use high-quality materials and equipment. We have lots of knowledge and are experienced in this field. We have everything you need to renovate your home, as we offer extensions, installations of floors, fitting and conversions. We also do repair work, gazebos, conservatory construction and others. Please, dial our phone number to get in touch with us.